Publishing is one of the oldest and most influential businesses in the world. It remains an essential creative and knowledge industry, worth over $140 billion a year, which continues to shape our education and culture. Two trends make this a particularly exciting time. The first is the revolution in communications technology that has transformed what it means to publish; far from resting on their laurels and retreating into tradition, publishers are doing as theyalways have - staying on the cutting edge. The second is the growing body of academic work that studies publishing in its many forms. Both mean that there has never been a more important time to examine this essential practice and the current state of knowledge.The Oxford Handbook of Publishing marks the coming of age of the scholarship in publishing studies with a comprehensive exploration of current research, featuring contributions from both industry professionals and internationally renowned scholars on subjects such as copyright, corporate social responsibility, globalizing markets, and changing technology. 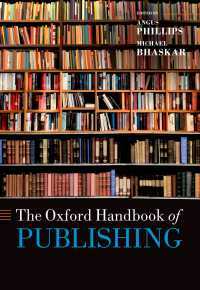 This authoritative volume looks at the relationship of the book publishing industry with other media, and how intellectual propertyunderpins what publishers do. It outlines the complex and risky economics of the industry and examines how marketing, publicity, and sales have become ever more central aspects of business practice, while also exploring different sectors in depth and giving full treatment to the transformational and muchdiscussed impact of digital publishing. This Handbook is essential reading for anyone interested in publishing, literature, and the business of media, entertainment, culture, communication, and information.